I’ve just returned to London from two fab months in NYC to find it’s absolutely scorching! Being a sun-worshipper, I’m never one to complain about steamy days, but there’s no doubt that hot weather can be hard on your beauty routine. If you’re melting in the heat, then it’s time to invest in some sunshine-friendly cosmetics – products that protect, rehydrate and revive your skin and your senses. To get you going I’ve selected my six summertime favourites. 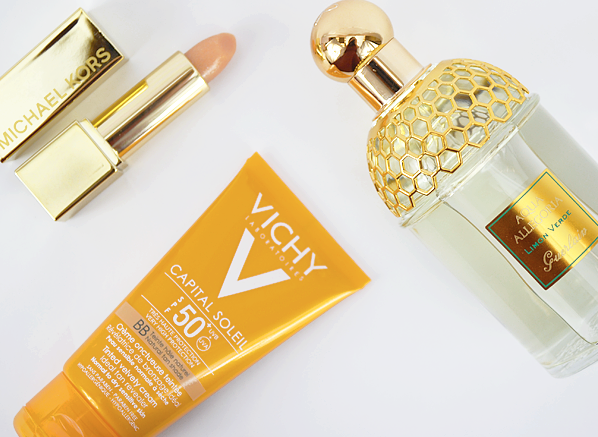 Vichy Capital Soleil BB Tinted Velvety Cream SPF 50: this is a real summertime special! A tinted sunscreen with a good strong SPF, it will protect your skin from the damaging effects of the sun’s rays, while also giving a lightweight coverage. It’s water-resistant, too, meaning it won’t wash off in the pool or sweat off in the heat. And that all adds up to happy, healthy, good-looking summertime skin. Clarins Fix Make-Up Spray: this is a real face-saver when things heat up. It’s a hydrating and refreshing spritz that gives over-heated skin a lovely cooling mist. Better still, it sets your make-up in place ensuring it lasts longer – and when you do heat up, it revives tired foundation and powder, brightening your complexion and reviving your look. Love it! Daniel Sandler Invisible Blotting Powder: this is a real make-up insider’s secret weapon. It’s a fine, colourless powder that ensures your make-up stays put, while banishing heat-induced shine. And thanks to its technologically advanced formula, it won’t cake or dry out your skin like some powders do. A quick dusting will keep you looking pristine for hours. Covermark Leg Magic: a favourite of celebs and red-carpet regulars, leg make-up will give you lovely looking limbs in a flash. It’s basically a foundation for your legs (though you can use it elsewhere on your body too). Instantly covering imperfections, this hypoallergenic formula boasts 24-hour staying power, a waterproof finish and SPF40 – which means you can even wear it in the pool and still be confident your legs look gorgeous! Michael Kors After Sun Lip Balm: the skin on your lips is some of the most delicate and sensitive skin on your body, and so needs extra TLC in sunny weather. The ultra-moisturising formula of this luxurious balm will help hydrate sun-chapped lips. It’ll give you a gorgeous pout too, thanks to its hint of pearlised shimmer. Clever and caring! Guerlain Aqua Allegoria Limon Verde Eau De Toilette Spray: I’m not going to claim this delicious fragrance will protect your skin, but I’ve always found that a spritz of fresh, citrusy scent really revives me when I’m flagging in the heat. This heavenly lemon and lime spray is like a tasty Caipirinha cocktail for your senses – and we all know how great a summertime cocktail makes us feel. Now, time to grab my sunnies and hit the park. Have a lovely sunny weekend everyone! Really love this powder, a light flick across the face sets foundation & touch up's for shine are simple & effective. Be careful when touching up, use very lightly. The compact is perfect, good mirror, very handy to slip into your makeup bag. This entry was posted on Friday, July 25th, 2014 at 5:04 pm and is filed under Binky's Beauty Blog #BBB, Guest bloggers, Make-up, Sun and Tanning. You can follow any responses to this entry through the RSS 2.0 feed. You can skip to the end and leave a response. Pinging is currently not allowed.